Shrimps are one of my favorite seafood. They are low in fat but high in cholesterol. I know these days some people are avoiding eating shrimps/prawns because of its high levels of cholesterol and not good for heart and overall health. Having them sometimes a year is kinda okay for me. I generally have then seven to eight times a year!! Yes, it is true that shrimps are my favorite but JB doesn't like it much so I avoid cooking at home and rather eat them outside. I love having them at Chinese buffets as appetizers, Thai entrees, salads, pastas and sometimes make them at home in our Indian way. So far posted only a single recipe on shrimp, this shrimp fry is a traditional way I cook whilst experimenting different flavors and spices with it. The recipe is simple and easy to follow, all you need to do is get a small bunch of curry leaves, coz that adds the real flavor and aroma to it. The best place to shop for curry leaves is the local Indian grocery stores. Shrimps really cooks fast in about 6-7 mins or so. Once they turn pinkish white, curls and turn opaque that means they are done. If your shrimps turn rubbery solid and hard to crack that means you have overcooked them! In this recipe, I used lightly toasted coriander seeds and cumin which gives the smoky aroma to it. Rest all are very common ingredients you will find in any Indian kitchen. Little garnishing makes it worth while. If using frozen shrimps thaw them at room temperature and de vein them and clean under running tap water. Add a tsp of salt,cover with a plastice wrap and refrigerate it. Dry roast the coriander seeds and cumin separately, cool and grind it into fine powder. Chop finely the red onion or mince it in a food processor, its the easy way to chop onion finely. Heat oil in a kadai and add the onions to it, fry for a min and then add chopped shallots and chopped green chillies. Add a pinch of salt to sweat the onions and then add finely chopped curry leaves. This is the main ingredient that gives flavor to this dish. Add turmeric/haldi, ground coriander-cumin powder, chilli powder and freshly ground black pepper. Fry for a min, sprinkle some water in between and cook till all the raw smell is gone for about 4-5 mins. Lastly add the shrimps, salt and mix well so that all spices are blended together, cover and cook for 6-7 mins on medium flame. Garnish with freshly chopped coriander and serve with hot rice or biryani. this one i will try.. yummy kanapadutundi nenu vandaka elagundo chepta :). 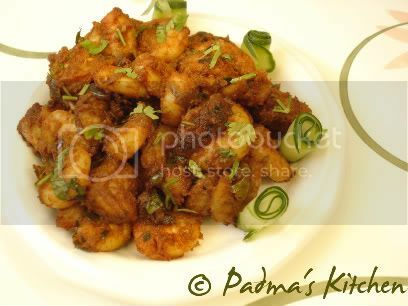 Thanks for visiting my blog.....U have a nice and lovely blog.....Shrimp fry looks delicious..
Hi Padma, so good to have you back. Glad to know that you had a good break and nice vacation. Hope you start blogging now in full swing. Take care. Shrimp is my favourite seafood too and I'd give anything to have some of your shrimp fry with Indian spices.